Easy to adjust hard hat delivers ultimate comfort and tough performance with engineering advancements in suspension design, a lightweight shell and patented UV indicator. 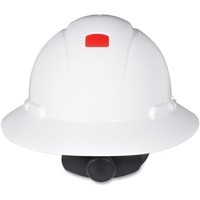 The Uvicator lets wearer know when to replace hard hat due to UV exposure. A 4 point, easy turning ratchet suspension delivers the balance and stability you need in demanding work environments. Comfortable suspension sits lower on your head to reduce pressure points and increase security, especially when looking up and bending down. Reflective material provides enhanced visibility. Absorbent brow pad provides comfort and ventilation. Protective, full brim hard hat also offers optimized comfort with three levels of adjustment and high impact resistance. Hart hat meets requirements of ANSIISEA Z89.1 2009 Type 1, Class C, G and E.